The symbolic Leaf pin is worn to show the world you are in mourning. The Leaf can be worn by any one, any time, not just in the early days of bereavement. You might want to wear it on an anniversary or just to let people know you are having a sad day. If someone asks you about the Leaf you can say it’s a mourning pin. When you see someone else wearing the Leaf, you can just let them know you recognise it, they’ll tell you more if they want to. 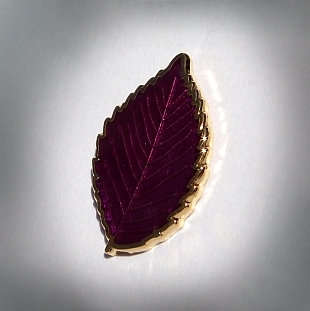 The leaf pin costs £3.99 (which includes postage and packaging). You can buy the leaf pin by clicking on the button below. Directed here from the Cruse website? Check this box to donate 15% of the purchase price to Cruse. There are times when conventional sympathy cards won’t do. 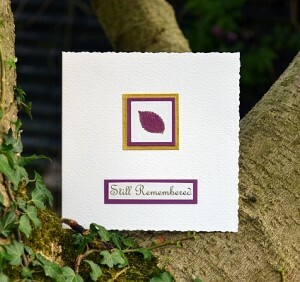 For an anniversary or another occasion when you want to just let someone know they are in your thoughts see our selection of memorial cards. The card costs £3.49 (which includes postage and packaging).